For those who are not already aware, I actually used to primarily be a Tetris personality three years ago. I was the play-by-play shoutcaster and event host for the 2012 world championship grand final, and I used to run a weekly Tetris show. I left Tetris not long afterwards because I determined that there was no future in it as an eSport. The lack of support I received from the Tetris Company and Blue Planet Software when trying to organize the tour­na­ment was appalling – it was as if they didn’t want me to give their game massive amounts of pub­lic­ity for free, with just a little bit of their help. We ultimately couldn’t even get a link to sign up for our tour­na­ment on Tetris Friends, which was the of­fi­cial Tetris “client” at the time. Coinciding with the troubles I was having with the Tetris Company, Hard Drop, the community with which I was associated, was also going through a bunch of changes. As a result of my declining motivation to work on Tetris-related projects, someone else came up to take my place in leading Tetris broadcasting. Unfortunately, my replacement was completely incompetent and had no clue what he was doing. He man­aged to somehow fumble together another year of world championship broadcasting, and it was a com­plete failure. I took this as my cue to leave Tetris entirely, and transition onto a different game. Sure, I personally enjoyed Tetris, but there was absolutely no future in it. Years later, I discovered that Tetris finally had a real client (instead of just an in-browser Flash extension), and the PC version would be released on Steam. Even though I left Tetris on unhappy terms, I still wanted to try it out. The reason I originally started doing work in Tetris was because I enjoyed the game – I liked playing, and I liked improving myself to be better. Digging back and pulling out all these nostalgic feels, I downloaded Tetris Ultimate for Steam on release day. I figured that, surely, after all these years, they would’ve made a great product. There were already so many Tetris clones with so many features, that they should’ve already known what the community wants in their games. There was literally no brainstorming required on the part of Ubisoft – they could literally just look at all these illegal, unlicensed copies of Tetris, and put in all the features into their own game. That is very exactly not what they did. In fact, they took features they already had in Tetris Friends and took them out. 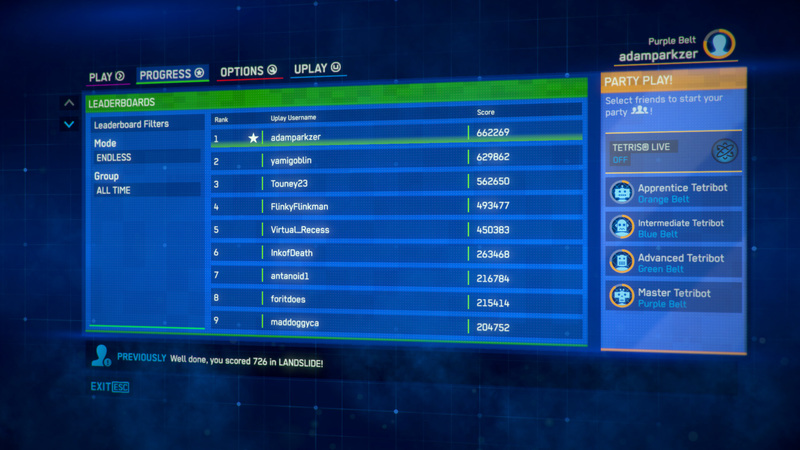 As you can probably tell by now, I’m very disappointed in the Steam/PC version of Tetris Ultimate. I thought this would be the next great thing in Tetris – the new universal hub for every member of the Tetris community to come together and enjoy some games. At this rate, I’m pretty sure people would rather play Tetris Friends in their browser, rather than purchase this US$14.99 inferior game. I already had a bad impression of the game immediately after loading it up. You expect games nowadays to be crisp and clean to 1080p resolutions. The menu is blurry. The text isn’t crisp or clean, and it’s fuzzy around the edges. You can’t tell from that small preview, but go ahead and click on the screenshot above for the full 1080p resolution. It looks like something in less than 720p was taken and stretched out, rather than rendered at true 1080p. You’ll notice that the menu is slanted in the opposite direction. Do you know why? Because, for whatever reason, the panel swivels back and forth, depending on where your mouse is. Sure, it’s some eye candy that makes the game a bit more flashy and fancy. But it’s probably the most ir­ri­tating and annoying thing that I’ve ever seen done with a menu. Usually, when you see an item, you move your mouse to it and expect it to still be there when you arrive and click. When the entire menu swings around and your destination is no longer at its former location, it can get pretty infuriating pretty quickly. So what was I hovering over in that screenshot? The “PARTY PLAY!” section. 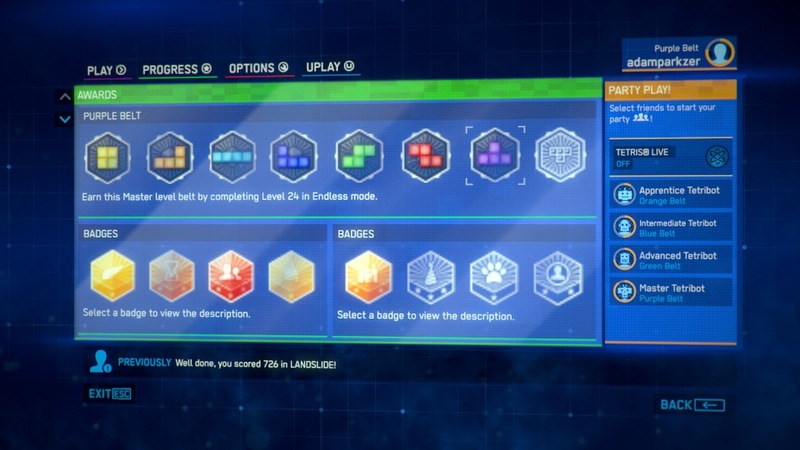 Apparently, you’re only allowed to add Tetribots to your party, unless you connect to Tetris Live. But, in my experience, even if you turn on Tetris Live … you can still only add Tetribots to your party. Let’s stop complaining about the menu and jump into the actual game. Surely, it will be better, right? Well, not so much. The first thing I noticed is the complete lack of control features. There is no initial hold/rotate feature, so if you play too quickly, a good number of your inputs are going to be ignored by the game. The auto repeat sensitivity and rate is very limited, and the game sometimes doesn’t even register a key release quickly enough, so the piece keeps moving, even after you let go of your arrow key. The ghost piece feature also clearly wasn’t thought through that well, because the game matrix is blue, and the J piece is blue. The ghost piece outline is an extraordinarily similar shade of blue as the matrix, so it’s very difficult to see where your J piece will end up. Sure, if you’re looking straight at it, then you can tell the difference between the two shades of blue. But, when you’re playing at an extremely high level with great speed, you end up just barely glimpsing at all the elements on the screen, rather than focusing in on one thing, because you need to take in as much information as possible, as quickly as possible. The profile and achievement system is also wildly mediocre. Not only can you not really tell what the a­chieve­ments are, because they’re so poorly organized, but the clear achievement series that you can tell (because it’s right at the top) – the belt system – is very shallow. You automatically get a green belt if you finish all the levels of Marathon mode. 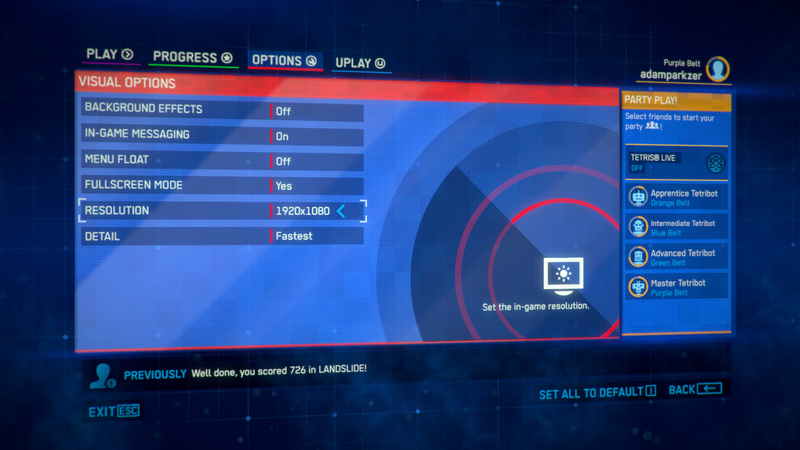 You get a black belt if you can complete Level 28 in Endless mode. (Also, since when is purple belt ever better than a red belt? Some martial arts even have red belt ranked higher than black belt.) There is absolutely no depth to it – you can literally become a black belt without ever really knowing how to play Tetris. The other achievements are so hard to keep track because of how badly the panels are organized. It seems like this game was designed for console, then, when transferring it over to PC, instead of redesigning it to work well with computers, they just copied the controller-based menu over. Grouped in with a bunch of random percentages that show up when you open your profile page (that represent the Tetribots’ achievements) (wait what? ), it’s very difficult to actually build up a profile of Tetris credentials because none of it is very intuitive. Not to mention, if you do manage to get badges, they’re all very pixelated. After playing Tetris Ultimate on Steam for a few hours, and thinking decently hard about it, I’ve concluded that this game is geared towards very casual players who are used to playing console games, but for whatever reason, want to play the PC version of Tetris. 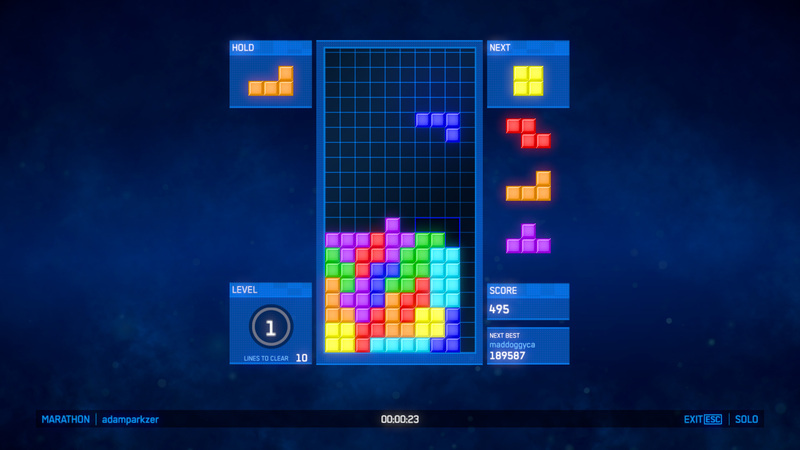 There is no way high-level players can appreciate Tetris Ultimate because of how little it addresses com­petitive needs. People who play at the highest speeds simply cannot, because there is a forced delay be­tween pieces where inputs are not accepted. Players who play at the highest levels against others world­wide, again, simply cannot … unless they are able to figure out the multiplayer settings better than I can. This was Tetris’ chance to prove that they really do care, and that they really have been keeping up with the communities of players who love their game. Without a doubt, they failed. In a quickly advancing and evolving era of gaming, where even near-perfect games still cannot become big, Tetris is eventually going to be buried as one of the classics that couldn’t break through into the mod­ern industry. After trying out this game, I’m glad that I left and moved on to games made by better companies with brighter, more innovative developers – instead of continuing to meddle with the struggling Tetris scene. Due to the overwhelming number of requests I have received to comment on the Tetris Tournament Online III grand finals broadcast, I felt like I could not ignore them any longer. I’ve given my opinion to a few different people in individual conversations, but like always, what I say always gets changed when passed along. So, I decided to post another official announcement again, this time regarding the results of the tournament. For those who are completely unfamiliar with the Tetris Tournament Online, it is the world competitive Tetris championship tournament, sponsored by the Tetris Company, the copyright holders of the Tetris brand, and organized by Hard Drop, the largest Tetris community in the world (as of today). The next most common question is how the tournament went. I managed to get the statistics for TTO3 from Twitch, Hard Drop’s primary streaming platform, and can give you a comparison to TTO2 from last year, which is the tournament where I hosted the stream and casted. Unique visitors. This is the number of different people who saw at least some part of the broadcast. TTO2: 37,963. TTO3: 3,340 (8.8%). Max concurrent viewers. This is the largest number of people who were watching the stream at the same time. TTO2: 2,049. TTO3: 604 (29.5%). An interesting supplementary piece of information – after TTO2 was over, we did fan games. During this time, the max concurrent viewers was 624. This means that we had more people watching fan games last year than the tournament had overall during the main event this year. Average minutes per visitor. This is how long, on average, people watched the stream once they arrived on the page. I’m not 100% sure how to interpret this correctly because they’re displayed as ranges on a per-hour basis, but these numbers are taken straight from the Twitch statistics. TTO2: 3-45 minutes. TTO3: 7-14 minutes (25.3%). To put things simply, TTO3 was massively less popular than TTO2. The next main question I received was why this happened. The cause of this is simple – the leadership behind the tournament this year was insufficient. Hard Drop was not prepared to host the tournament yet, but an unqualified individual took over the lead and pushed this tournament to release without proper preparation. The founder of Hard Drop did not stop this because all he was interested in was to get something happening in the community. Finally, the last question is if I will ever be re-entering the Tetris scene to revive streaming and broad­casting with high-quality production value. Unfortunately, I have no answer to that at this point. The primary determining factor is if the Tetris Company will start making an effort to promote their brand again. If they make an effort to improve the official Tetris game (which at this point is Tetris Friends – they can either improve it or make a new one), and become more motivated to get people involved with Tetris, then yes, I may consider re-entry. If not, then I will not. I do a lot of things on the Internet, so you might not necessarily know me for this, but a good handful of people discovered me due to my primary streaming leadership role in the Tetris Tournament Online II, the official annual Tetris tournament sponsored by the Tetris Company, the official copyright holder of the Tetris brand. Many people were looking forward to Tetris Tournament Online III (TTO3), the sequel to last year’s tournament, and they were eager to have me return this year as a streamer and shoutcaster. However, most of these people noticed that I have not been the one streaming or shoutcasting any of the TTO3 matches so far. I did announce some specifics about why I have not been the one streaming, but due to the unofficial nature with which I shared the information, a lot of it was lost or changed as it was passed on from person to person. There have also been some particular individuals who intentionally changed information as a personal attack to me. To make things easier for everyone, I decided to publish my reasons here. If you hear anything else not included in this list, and it seems a little outlandish, it’s probably a rumor. I am gravely disappointed in the Tetris Company, and do not feel they deserve the publicity and free advertising that comes with Tetris Tournament Online. Their cooperation last year was mini­mal, and they just barely provided enough to get the tournament running. Nobody with whom I spoke showed any sort of genuine excitement about the tournament. The amount they supported our tournament was abysmal. They had many outlets to let Tetris enthusiasts know about our tournament so they could sign up, compete, and watch others’ matches; these outlets were barely used at all. Instead, a majority of our publicity came from Twitch, with whom I partnered in preparation for the event. I received next-to-zero compensation from the Tetris Company for the work I put in last year. The competitors at least received mediocre prizes – the first place winner received an electronic, but the runners up received prizes worth less than the shipping costs needed to send them internationally. The stream­ers, organizers, and hosts received absolutely nothing. The only benefit I received whatso­ever from streaming was a little bit of advertising for my website via the logo I had on the stream overlay. My co-commentator for the grand finals received literally nothing. I no longer have the time to put into Tetris. I graduate from undergraduate university, and have moved on to a graduate and licensure program. I no longer have the time to do whatever I want with my free time like I did when I was an undergraduate. I also have other things into which I must invest time. I no longer have the resources to stream. Back when the Tetris Tournament Online II was going on, I lived in my own apartment in Madison, WI that came with free 50 Mbps Internet. I no longer live in Madison; I moved out after I graduated. I now live back at my regular house in my home town, and commute to my graduate university. This also means that we don’t get free Internet, and the Internet we have is approximately 1.5 Mbps – nowhere near fast enough to stream anything at any viewable quality. The time I do spend on gaming, I would like to spend on games that have a future. At the rate the Tetris Company is going, Tetris has no future. Their attitude towards the Tetris community is counterintuitive, and is causing them to miss out on opportunities that will make their game more popular. On the other hand, there are plenty of other game developers who engage closely with their community and player base that has a much more promising future. I am going to stick with those companies. Hopefully that will satisfy a lot of curiosity revolving my Tetris situation. Again, there is a lot of incorrect information intentionally being passed around by individuals who oppose my decision and wish for my failure. If you wish to remain at a neutral or supportive stance with me, I ask that you combat the wrong information by linking to this post, or simply by just not passing the wrong information on further. If you’ve been an avid watcher of my stream shows, you might already know that I had a stream show that took place weekly, every Friday, back in the spring of this year. I discontinued that show when the summer started (in the northern hemisphere) because I was on break from university, and I no longer had a reliable schedule or Internet available for consistent streaming. Upon returning to university, I still didn’t bring my show back right away because the Tetris Tournament Online II was going on, and casting tournament matches was taking up enough of my time that I felt it would be beneficial for me to not stream even more Tetris on top of that to ensure that I could tend to my other responsibilities as well. I said that I would eventually start streaming Tetris again on a weekly basis in a form of a show once the Tetris Tournament Online II was over, but I never actually specified exactly when it would start again. Apparently, there was some miscommunication and pretty much everybody except me knew that I was supposed to be streaming tonight. I didn’t want to let anybody down, so I just hopped on stream and broadcasted a relatively short impromptu stream show on NullpoMino League without any preparation. I wouldn’t really say that stream was much of a success because it was on NullpoMino League, and not on Tetris Friends like my stream shows usually are. Of course, NullpoMino League is a lot less popular than Tetris Friends is, so we ended up having a very limited set of players to observe throughout the stream. Also, as I mentioned above, I wasn’t very prepared for this stream, so we ended up coming up with random stuff to do on the spot, including reading tongue twisters for the last 20 minutes of the stream. I most likely will not be streaming next week, because I have to get a lot of other stuff done and organized before going live with a regular show again, but stay tuned to my blog for updates on when a show might be coming up. If you like watching Tetris in general, be sure to follow the Hard Drop Twitch.TV channel to be updated whenever we go live with some more Tetris. The grand finals of the Tetris Tournament Online II are now over. I posted a news article on HardDrop.com with the replay videos, statistics about the finals stream, and shout-outs and thanks to our supporters and spon­sors. You can find that at http://harddrop.com/article/article_481/. For archival purposes, I am also going to post the content of my message here as well. Here’s what you’ve all been waiting for – the replays of all tournament matches have been edited, rendered, and uploaded for your viewing convenience. If you’re unfamiliar with who I am, I’m Parkzer – one of the shoutcasters for Hard Drop, and the lead coordinator for live streaming for the Tetris Tournament Online II. I can honestly say I was very satisfied with how the stream of the finals turned out, and I’m glad that I was able to be a part of it. To demonstrate exactly why, I decided to share some stats about the stream. First of all, I’d like to start with the number of concurrent viewers for Tetris Tournament Online I (last year’s stream): about 1,000 across two streams. This stream was run entirely by the staff members at Blue Planet Software through UStream, and there was a lot of controversy regarding the quality of their streaming and commentary. Here are the stats for this year’s TTO2 stream, entirely managed and run by the streaming crew at Hard Drop via Twitch.TV. Maximum concurrent viewers: 2,049. This means that, at one point during the stream, we had over 2,000 different people watching at the exact same time. Total video plays: 74,564. This means that our stream was loaded 74.5k times throughout the event (this counts people who refreshed the stream as multiple plays). Total unique visitors: 37,960. This means that we had almost 38k DIFFERENT PEOPLE who saw at least some portion of the finals tournament broadcast. Of course, we definitely did not do this alone. First of all, I would like to give a huge shoutout and thanks to Twitch.TV for all the promotion and support they have given us throughout the tournament. They featured us on their home page, and I personally think it was one of the biggest influences to our viewership. Also, a very special thanks to Ernest Le from Partnership Strategy at Twitch.TV – he has worked with me closely leading up to and throughout the entire tournament to ensure we have the best streaming experience possible. We also have thanks to give to Blue Planet Software and Tetris Online. Not only did they donate all the prizes for the tournament, they also helped us promote the tournament by posting a news story on the home page of TetrisFriends.com, bringing awareness to our event. And finally, a huge shout-out and thank you to all our viewers and supporters who watched any portion of the stream. You guys are the reason we’re able to do this, and you guys are my primary motivation for getting back on the stream each week. If you missed the stream, it’s definitely worth checking out the replays. If you’re interested in just the matches, you can use the videos embedded above. If you want to watch the whole stream, including the pre-game show, all the technical difficulties I had while the stream was live, and the fan games we had at the end of the tournament, you can watch the raw replay files on our Twitch.TV channel at http://twitch.tv/harddrop. Disclaimer: the views and opinions expressed in this post are Parkzer’s and do not necessarily reflect those of the Hard Drop administration or community. Tetris Tournament Online II Live Now! The pre-game show of the Tetris Tournament Online II is streaming live now, and we are just about to get started with the semi-finals and grand finals. In case you’re not already watching it, I’ve embedded Hard Drop live channel player below. In case you got here a little late and the stream is no longer live, no need to worry. Immediately after the event is over, I will start working on getting the replays edited and uploaded to YouTube. Once all that is done, I will post an update on the Hard Drop website and link to the article from my website. If you’re impatient, or if you want to see the raw footage from the stream, you can click on the “Videos” tab on the Hard Drop Twitch.TV channel to see if they are available yet. 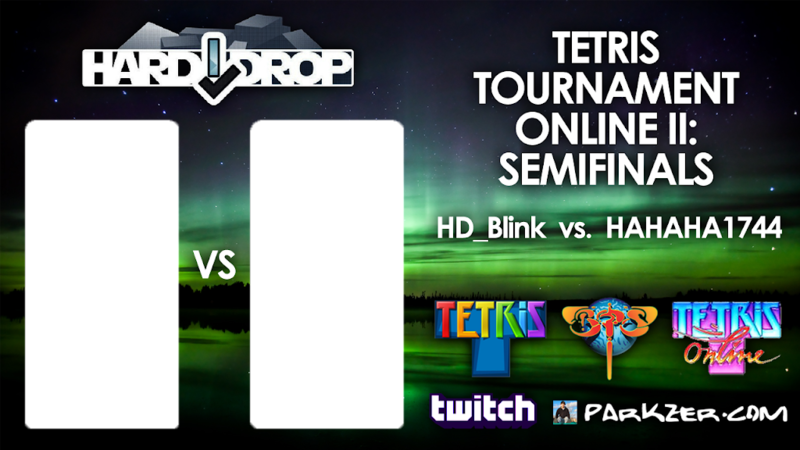 Tetris Tournament Online II Grand Finals Streaming Tomorrow! 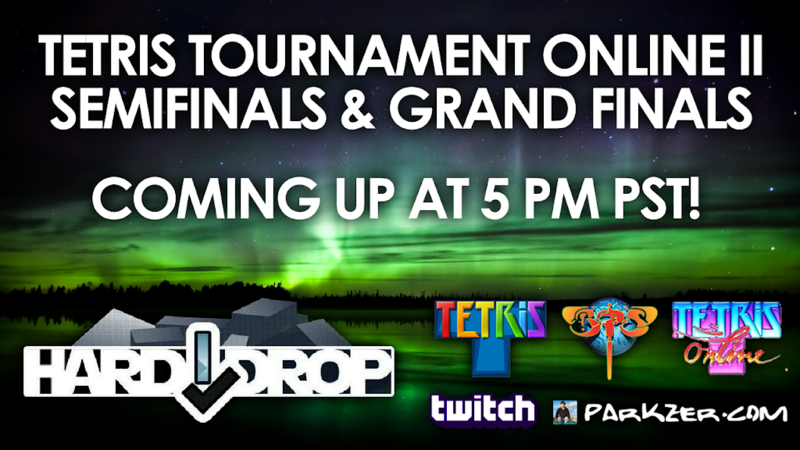 This is a quick reminder not to forget to tune in tomorrow for the finals of the Tetris Tournament Online II. The event will be streamed on the Hard Drop Twitch.TV channel, and I will be the primary shoutcaster for both the semi-finals and the grand finals. The pre-game show will start at about 4:30 PM PST. We don’t really have a lot planned for the pre-game show, and I plan on just chatting with viewers for half an hour before the games start. The primary reason for having the pre-game show is to get people starting to watch the stream before the games start, and to begin attracting attention to the event. The actual games will start at 5 PM PST. The first set of matches will be the semi-finals, and will be between HD_Blink and HAHAHA1744. HD_Blink climbed his way up to second place in last year’s tournament; we’ll see if he can do that again this year. The loser of HD_Blink vs. HAHAHA1744 will be crowned third place, and the winner will move on to the grand finals to face hebo_MAI. hebo_MAI is the current reigning champion, and will be defending his title to see if he can secure it two years in a row, or if we will have a new world competitive Tetris champion. I know you guys love it when I show previews of the overlays I will be using, so I decided to post it here one day in advance again. Of course, we don’t know the two players who will be playing in the grand finals, so I’m not going to show a preview of it here as the overlay itself has the names of the competitors on it, and we won’t know for sure whose name should be on it until tomorrow. However, I do have the one for the semi-finals set up, and it looks aesthetically identical to the one for the grand finals except for the fact that the words will be different. We expect this to be an event of grand proportions, and it is definitely not something you want to miss, so be sure to mark it on your calendar. Last night, I live streamed and casted a Tetris Tournament Online II match between Blink and SirJeivus. If you’re familiar with the competitive Tetris communities, both of these competitors are very well-known individuals – Blink is the founder of Hard Drop, and SirJeivus is an ambassador for the Taiwanese Tetris community, as well as someone who works closely with the Tetris Company. This match was a loser’s bracket match, which meant that both these competitors had already lost a game once during the tournament, and the loser of this match would be eliminated from the entire tournament. My co-caster for this set was veteran caster Pierce, better known as Paradox in the Tetris community. The casting we did is actually very different than what you might normally see from me – I generally am a shout­caster and my co-commentator is on analytical commentary, but for this set, Paradox and I basically split the spotlight in half and had more of a conversational and interactive commentary. Although it’s different, we both like how it ended up. If you’d like to find out more information about the tournament, you can head on over to the Hard Drop tourney page. If you’d like to be notified every time Hard Drop goes live with some more competitive Tetris, you can follow Hard Drop’s Twitch.TV channel.